Our current healthcare system is full of competent and caring doctors, nurses and other healthcare professionals working hard to do right by their patients. But the system as a whole just isn't delivering what patients or providers need. Dysfunctional incentives create fragmentation and fail to address the underlying drivers of disease. In addition, far too many decisions are now in the hands of insurance companies, not doctors and patients. What we need is an approach to healthcare delivery that is coordinated and patient-centered. And we need to keep people from getting sick in the first place. Under the Patient Protection and Affordable Care Act, we are taking steps to redesign our healthcare system to do just that. We are increasing access to preventive and primary care, promoting better coordinated care and care in the right settings, and reforming payment policies to drive higher-quality care. For example, two-thirds of Medicare spending is for beneficiaries with five or more chronic diseases. Yet, the traditional Medicare system pays doctors for the quantity of services provided rather than for taking the time to help manage and coordinate care for their patients. One of the first changes the health reform law makes is to provide every Medicare beneficiary with an annual wellness visit with their primary-care doctor free of charge, starting in 2011. This way, doctors and patients can create a plan to prevent illness or create a treatment plan that meets all of a beneficiary's health needs. Also starting next year, Medicare beneficiaries and many privately insured Americans will no longer have to pay cost-sharing for basic preventive services. By getting patients in to see their primary-care doctors sooner rather than later, we can avoid higher rates of illness or disease complications down the line. The health reform law also promotes innovation in how we pay for care so we improve our healthcare delivery system. These efforts will be pioneered in the Medicare program, our nation's largest single payer for care, and some of those initiatives will start as soon as 2011. Many smart health policy researchers and doctors across the country have ideas for how to make our healthcare system work better. The health reform law establishes a new Center for Medicare and Medicaid Innovation, which is tasked with identifying and testing promising new models for delivering and paying for healthcare. The center will be able to look at promising models, such as patient-centered medical homes that are tailored to patients' individual needs and efforts to promote more coordinated care through payment reforms. In another effort to encourage more integrated care, the health reform law creates new incentives for physicians to join together to form “accountable care organizations.” These groups allow doctors to better coordinate patient care and improve the quality, help prevent disease and illness, and reduce unnecessary hospital admissions. If ACOs provide high-quality care and reduce costs to the healthcare system, they can keep some of the money that they have helped save. A large part of these delivery system redesign efforts is making sure that patients are receiving care in the right setting. We know nursing homes and other institutional settings aren't right for all patients. The new Community First Choice Option program will expand the availability of home- and community-based services for disabled individuals through Medicaid. These programs are part of broader efforts in the law to reform healthcare payments, which we believe are necessary steps to redesigning how we deliver care. The incentives in the current system are geared toward quantity rather than quality. There are an array of ways that the health reform law is moving payment from quantity to quality and value. In 2013, a new national pilot program will encourage hospitals, doctors and other providers to work together to improve the coordination and quality of patient care. Under payment “bundling,” hospitals, doctors and providers are paid a flat rate for an episode of care rather than the current fragmented system where each service or test or bundles of items or services are billed separately to Medicare. For example, instead of a surgical procedure generating multiple claims from multiple providers, the entire team is compensated with a “bundled” payment that provides incentives to deliver healthcare services more efficiently while maintaining or improving quality of care. It aligns the incentives of those delivering care, and savings are shared between providers and the Medicare program. We will also start creating more financial incentives for high-quality providers. A new Medicare value-based purchasing program will increasingly link payments to hospitals to the quality, patient-experience and efficiency of care that they deliver. We will expand these efforts in 2015 by beginning to actually tie physician payment to the quality of care they provide. Together, the reforms in the Patient Protection and Affordable Care Act represent the most sweeping changes in how we measure, pay for and encourage changes in the healthcare delivery system that we have seen in a very long time. At the same time, our work is just beginning. While Medicare will be leading the charge, we are looking for ways that Medicare can work closely with other public payers and the private sector. We will be following the many innovative pilot programs to learn what works best for doctors and patients—and work to translate that across the healthcare system. Our future must see a system that has the patient at the center, relies on teams of talented caregivers, provides financial rewards to those who improve care, and eliminates the inefficiencies that plague our current system. Working with the men and women and institutions across the country who are committed to this vision—in fact, many of whom created this vision—will ensure the success we need. 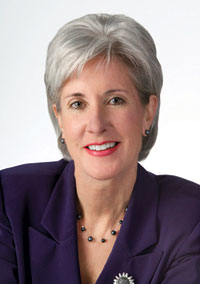 Kathleen Sebelius, a Democrat, is the HHS secretary.